I have a new plc and am trying to connect the first time on power up. I have done this many times before but now am having an issue that I do not understand. When attempting to connect the first time I am using my usb connection in RSwho active and selecting the processor. When attempting to upgrade the firmware I am getting an error stating" Failed to begin update to the target device. The target device is not in the proper mode to accept an update." its error message 11006 . I have the switch to program mode, I reset the power a couple times and still no success. I cannot clear a flashing red light on the plc ok status light but i think its because there is no program in the plc yet. what am I missing?? 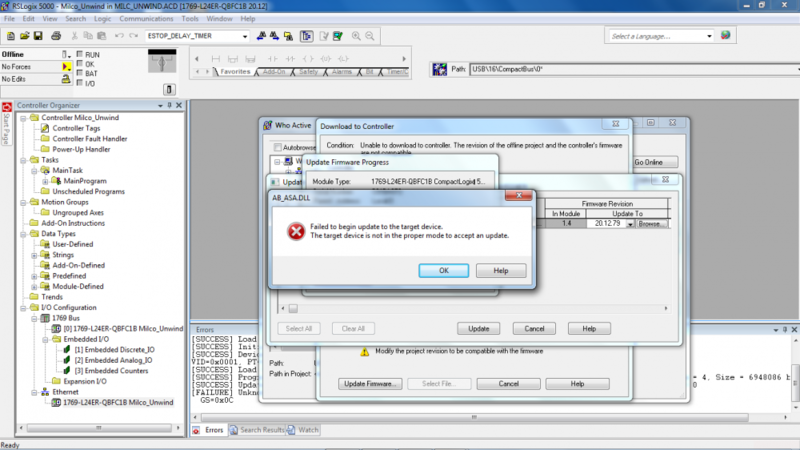 i added the pics of the error messages. Open The Door and switch the switch to Remote [REM]. PLC is most likely in run. Post a screenshot of that RSWho window. When you browse RSWho, be sure to select the FIRST controller object you see in the communications tree. While you can "drill down" from the Ethernet interface to the backplane to the CPU object, that's not the appropriate path for one of the modern CompactLogix controllers where the Ethernet and the CPU are integrated. 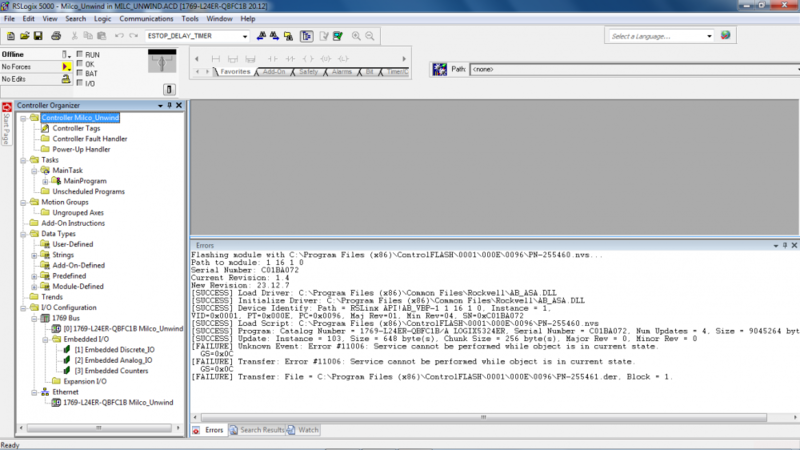 Followup: now on a bigger screen, I see the "Path to Module" in the ControlFlash log as "1 16 0 1". That suggests that the Path given to the ControlFlash session was recursive and pointed through the backplane, then back to the controller. I don't have a controller handy to check on this, but it makes sense. So i tried every comm path i had available on who active without Success. Any suggestions? There are a handful of suggestions in the RA Knowledgebase. Among them are making sure that the controller is not connected to an active network if you're trying to use USB, or using USB to set up an IP address then doing the upgrade over Ethernet. Since it's an L24 controller, be sure there's an End Cap (1769-ECR) attached to the I/O bus. First thing, make your communication should be properly,then this pdf file helpful to you. I've had this happen before ("not in the proper mode to accept an update"). I changed the PLC to program and was able to flash the firmware.